Prime the skin with HD Micro Primer, smoothing fine lines providing an even surface for the base. 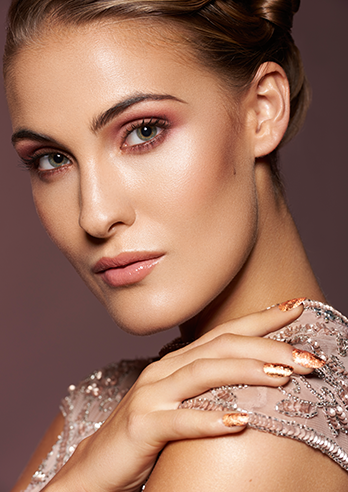 Shimmering Event Foundation (golden beige) is lightly buffed into the skin before applying Ultra Foundation. HD Micro Foundation Cream 8.5 g is blended flawlessly creating natural highlights and contours. 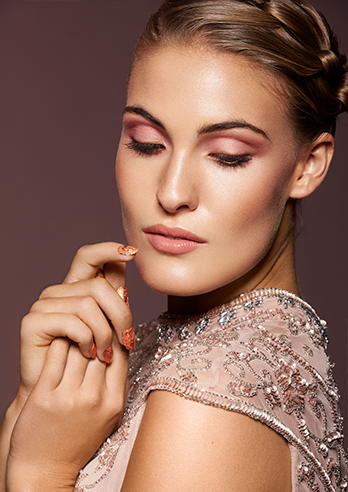 The cheeks are rouged and glossed using Glamour Glow (blush peach), Glamour Glow (natural tan) and Glamour Glow (blush rose). Eye Shadow Primer is massaged into the eyelid hydrating and providing a durable surface for the Eye Shadows. Rose Quartz G and Eye Shadow Iridescent (golden pink G) are pressed into the lids. Eye Shadow Eye Shadow Iridescent (cherry G) and Eye Shadow Iridescent (sunset G) are blended into the socket line and out from the outer corners of the eye creating a luxurious halo. Eye Shadow Iridescent (bordeaux G) is concentrated under the bottom lash line. HD Cream Liner (cacao) is applied to the inner waterline and then softly smoked along the top lash line. The eyebrows are brushed through with a clean mascara wand and defined with Eyebrow Powder (light) and Eyebrow Powder (medium). Eyebrow Forming Gel is then applied through the hairs to hold them in place and add a natural sheen to the brows. After curling, Mascara Color Intensifier (black) is layered onto the top and bottom lashes. The lips are defined using Faceliner (34). High Gloss (cherry blossom) is then pressed into the entire lip. A hint of High Gloss (illusion) is then added to the center. Finally, Shimmering Event Foundation (gold) is massaged into the arms and legs.